Queen Elizabeth National Park is located in the Western Uganda and it lies on the base of the Rift Valley between Lake George on the right and Lake Edward on the western side. It is situated side - saddle of the equator and in the Southwestern Uganda near Kasese. It spans the districts of Kasese, Kamwenge, Bushenyi and Rukungiri. After breakfast our driver / guide will pick you from your place of rest for a comfortable safe drive to the park that boosts the highest biodiversity rating of any game park in the world with its dense swamps, incredible crater lakes, open savannah and rainforests. A short stopover at Mpambire for an interactive talk with the local royal drum makers, this is fun en-route to the Equator for photo shoots. We proceed to Mbarara where we shall have our lunch and rest for awhile. Get to the park in the evening, Dinner and over night at Mweya Safari Lodge / kasenyi Safari lodge / Simba safari lodge (Full Board). After lunch go for a stress free Launch cruise, so interesting on the Kazinga channel, buffalos, hippos, crocodiles will be seen around the edge of the channel as they cool off and birds like, the water bucks, noisy hornbills, the two species of pitas, African grey parrots, rare shoebill, Egyptian geese, yellow billed stork, white pelicans and many others. Dinner and over night at Mweya Safari Lodge / kasenyi Safari lodge / Simba safari lodge (Full Board). Day 3: A visit to Volcanic Lakes. Take breakfast and go check on the beautiful volcanic crater lakes with different minerals. They are formed as a result of volcanic eruption which occurred after faulting took place on the 1st lines and weakened them which gave away to volcanicity to take place hence the formation of the crater lakes like; Lake Nyamunuka which locally means a rotten egg and it is so because it smells so much like one. It is said that Nyamunuka is blessed with sulpher mineral and it is proved by its rotten egg smell. 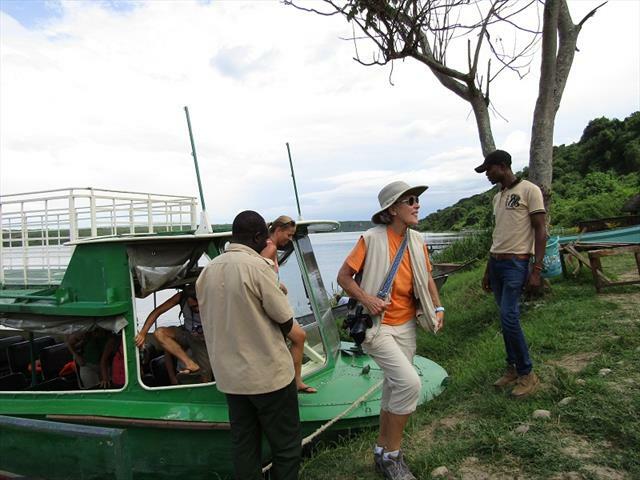 Lake Katwe along the Mweya peninsular which is well known for salt mining, Nyamusingiri, Kyasandika and Nyakasenyi crater lake around the mating grounds for kobs and various lions waiting to prey on the new born kobs. Back to the lodge for lunch while cooling off at the pool and relaxing. Dinner and over night at Mweya Safari Lodge / kasenyi Safari lodge / Simba safari lodge (Full Board). Day 4: Chimp tracking and Forest walk. After breakfast, set off for Kyambura this originated from Kasyoha-Kitomi forest in the Esika district for chimp tracking. It was formed by faulting, the strong earth crust occurred vertically and horizontally which deepened and widened leading to this wonderful habitant for a number of chimpanzees. There are 3 families and there are 4-5 members in a family. Sit down quietly in the rainforest from 8 - 9 or 10am watching the different families of chimps playing and talking to each other while the birds sing sweetly in the trees. At the same cost, also enjoy other primates like the black and white colobus, red colobus moneys, olive baboons etc. Still on time, move to Maramagambo forest to see the bat cave which the hunters used as a hiding spot and the blue river where people used to conduct cultural rituals. A number of reptiles, butterflies, primates, animals will be seen in the forest. Back to the lodge for Dinner and over night at Mweya Safari Lodge / kasenyi Safari lodge / Simba safari lodge (Full Board). Day 5: From Queen Elizabeth National Park to Entebbe. check into the hotel waiting for your flight departure. Our Driver guide will drop you at the airport.